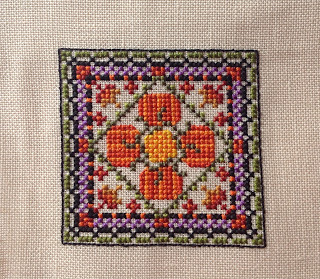 This month's stitching pie has been dominated by 2 projects which were my Focus for a Finish; Just Nan's Haunted Autumn Mouse in a House and Joan Elliott's September Fairy. Here's the Mouse and the House in case anyone has been asleep through the last couple of posts and not seen it! Despite spending 15 days working on the September Fairy I still haven't finished her which says a lot about the length of some of those days - very short on stitching time! 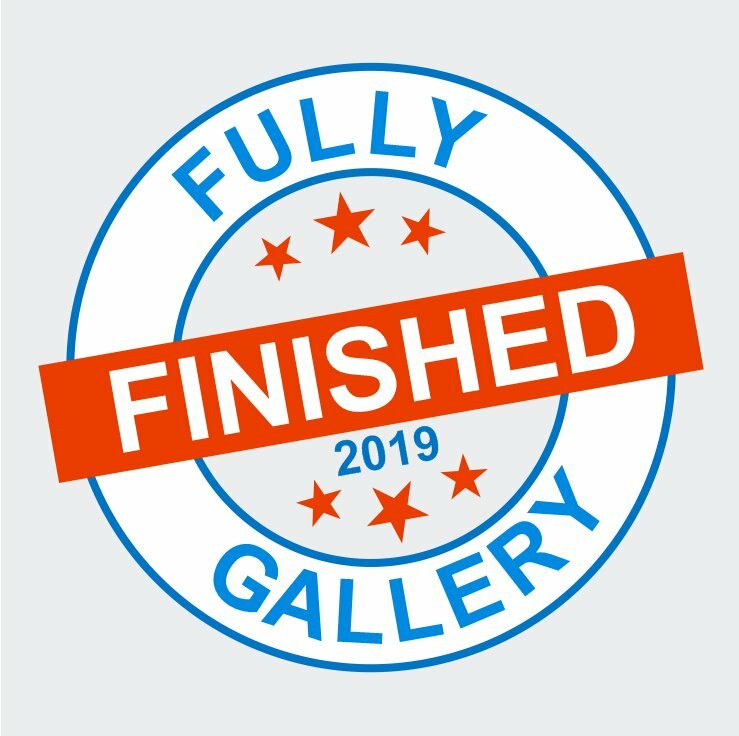 But not the whole thing because I am close to a finish! 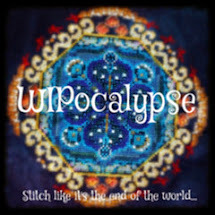 I have to complete the backstitch and add some beads. There are also two little stitches in the moon that need the top leg completing, ran out of thread at the last minute! So she will be another finish this weekend. No money left from my Birthday funds and not spending anything until Christmas. Finally, it's so very nearly time for the Advent Calendar Blog Hop! I will be putting the post up tomorrow morning and starting the Countdown to Christmas. 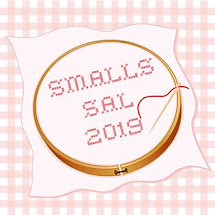 This is going to be a rather small Smalls post. I've been focusing on finishes this month and haven't had as much stitching time as I'd hoped. So no 12 Days of Christmas this month. 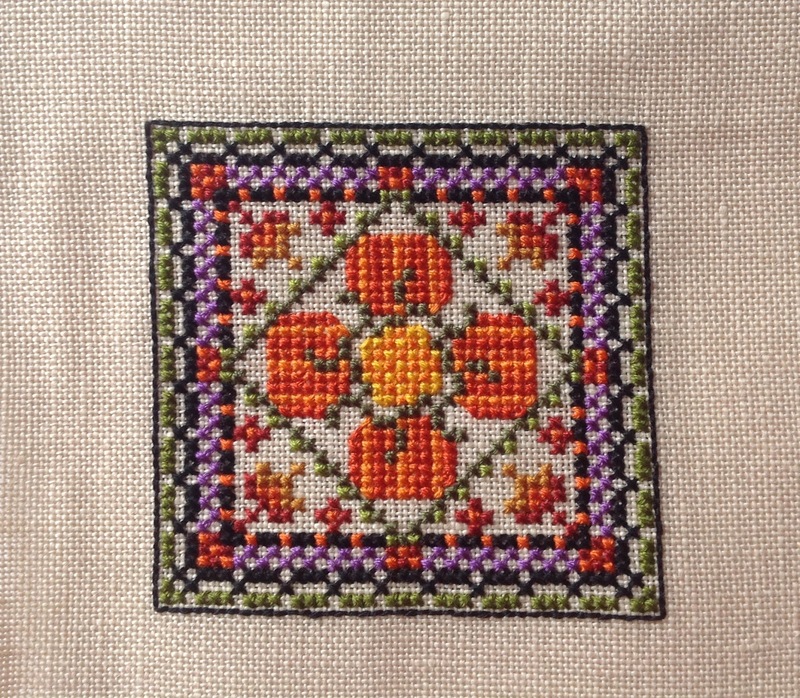 I've also put the 30-a-day stitch on hiatus. I have also spent some time sorting out the Advent Calendar Blog Hop and everyone has their date and the discussion topic for this year. I'm very excited to see what everyone posts. Finally, I get regular emails saying "this person is following you on Bloglovin'" but I never see comments from those people. So I'd like to ask my Bloglovin' followers - is there an issue with commenting? Obviously, if there is, then you can't leave a comment to tell me! So email joanneperry179@gmail.com and let me know. This will make you smile. Each day I take a quick photo with my iPad and upload it to Facebook. I don't worry about lighting at all, just as it comes. So this is the first 20 days photos. You wouldn't believe it's the same fabric, would you? The first day is the most colour-accurate. 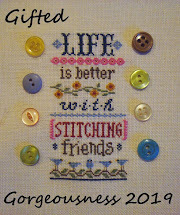 November – What new stitches or techniques did you learn this year? I made my first mouse! I have done 3D designs before but this was my first Just Nan mouse. There may be some new speciality stitches in my Chatelaine but I'm not sure. I can't wait to do more on this next year! I plan to spend at least one week each month stitching on Gardens of London. It would be nice to get all four corner gardens done. I accept that this will be a VERY long term project. 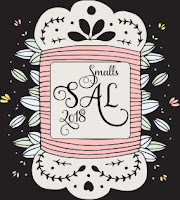 Finally, I have all the names for the Advent Calendar Blog Hop entered into my spreadsheet so now all I have to do is email everyone with their dates and draft the post ready for the 1st. I hope that you are all looking forward to it as much as I am! But hopefully getting some stitching in anyway. As well as arranging the Advent Calendar Blog Hop. 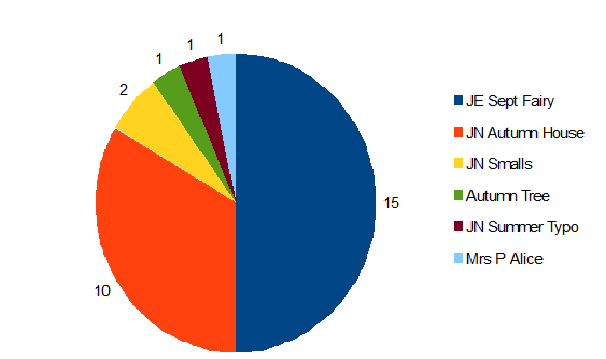 For this hop, each participant is allocated a day in December to make their post on. They will show something they have stitched on a Christmas theme and answer the topic question I set. 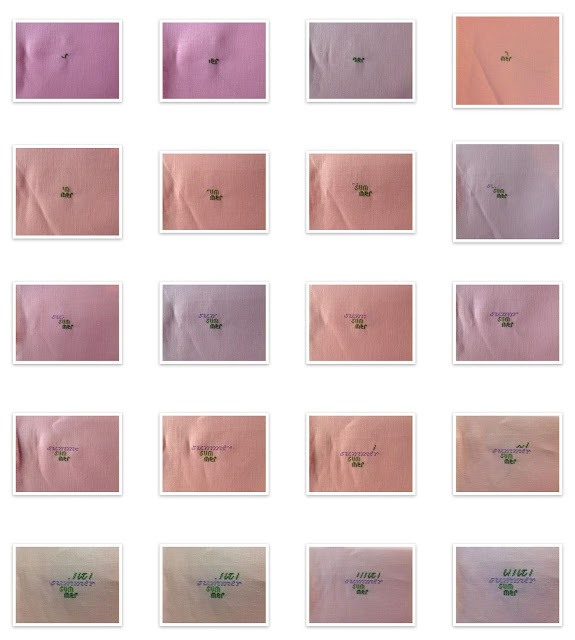 I then copy their photo onto my blog post in the style of an Advent Calendar. So if you'd like to join in, please leave a comment or send me an email. Let me know if there is a date you would particularly like or one you'd like to avoid. I will be in touch towards the end of the month! 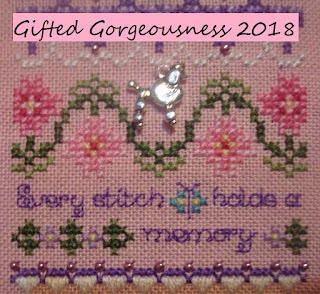 This week I've been focusing on Joan Elliott's September Fairy from the 2013 Diary (Year of Magical Stitching). Once I finish the wings there is just an enormous yellow moon to stitch! You can see we are back to greens again which is between 7 and 14 degrees C or 45-55 degrees F. Below 45 goes turquoise. Finally, I've still been busy with my rock painting and hiding. 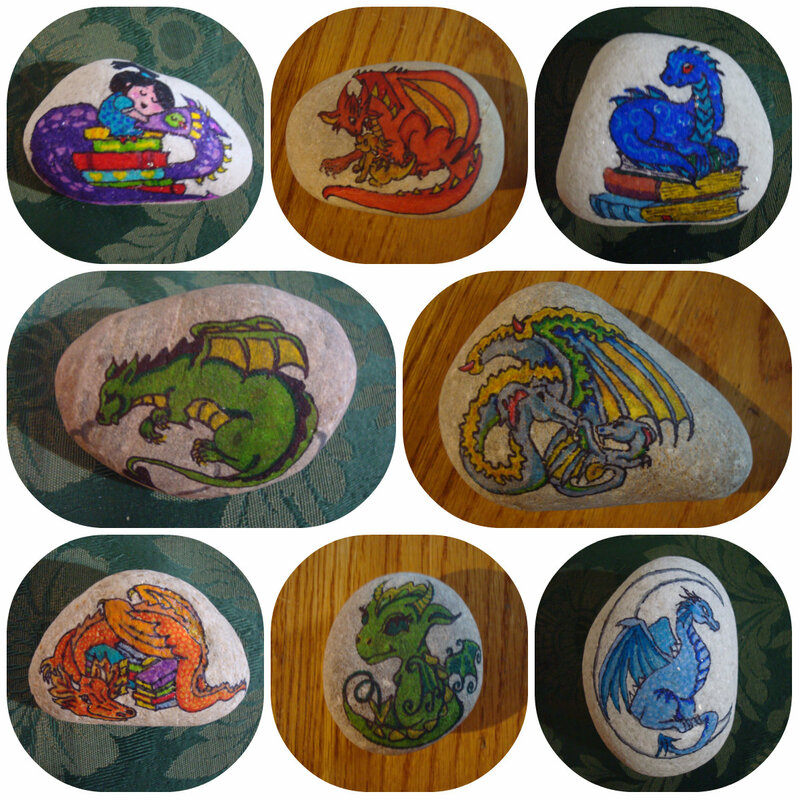 The kids still seem keen to get out at the weekends and after school to look for rocks and the parents are still have fun painting them! I've been doing dragons just lately, what a surprise! Can anyone spot the two based on cross stitch? 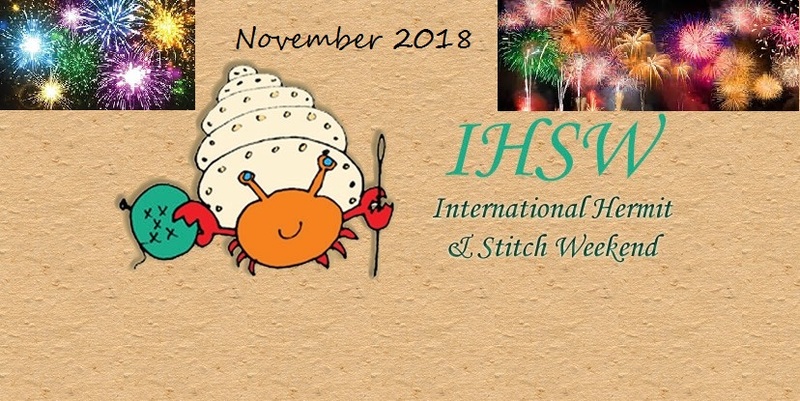 We've just finished the penultimate International Hermit & Stitch Weekend of the year, the next one will be right before Christmas and I'll be working both days so I doubt much will get done then. I was actually working this Saturday (Fantastic Beasts Crimes of Grindelwald launch) so only had Sunday for stitching. The second framed piece is an older finish from 2016. This is Hallowe'en Town by Frosted Pumpkin Stitchery. It was a mystery release and I really like the first house but as the design grew I wasn't so keen on the rest of it. 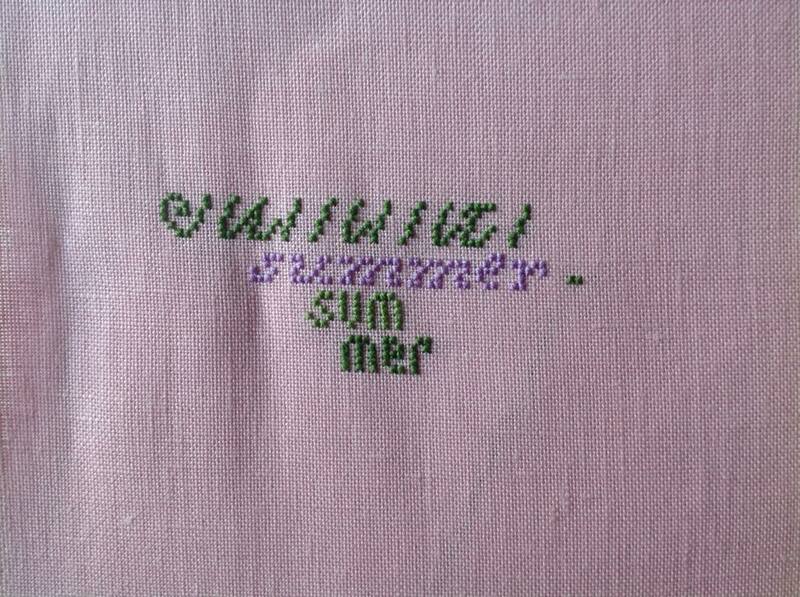 So it rested for a little while and then I decided to stitch this piece and call it done. This is why I don't do mystery SALs anymore. The old UFO is this Autumn Tree which was a freebie on one of the old Yahoo groups (who remembers them?). I saw it on someone else's blog and loved the design. I used DMC 51 to stitch all the speciality stitches. It's a lovely mixture of yellow, orange and red. The fabric is a plain pale green evenweave. Prettier than the photo suggests! I only had the beads and the french knots to do. The original had an owl in the centre space but I decided to add a witchy touch and used a crow charm instead. I also added a pumpkin and a tombstone RIP. Which is what this project can do now! When I finished my framing session I got back to my current Focus on a Finish project. Another one of my "18 in '18" started last July and only worked on once this year for the Longest Day SAL. This is Joan Elliott's Reading Fairy from her 2013 Diary (now available as a chartpack called A Year of Magical Stitching). 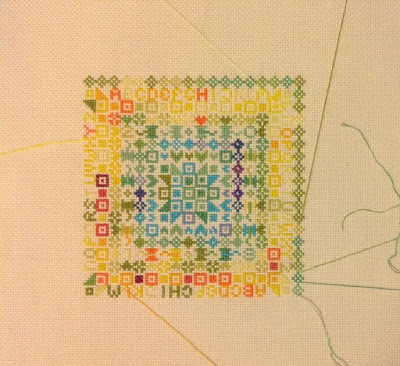 I like these monthly updates on Alice, it makes it look like progress is taking place much faster than it seems as I stitch! A few people have said that they don't do Facebook and asked if I could host a link-up for them, so here it is! Just add your name and the link to your actual IHSW post, not just your blog home page. 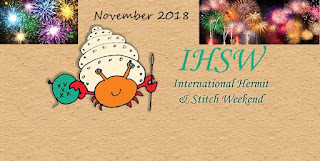 The next IHSW will be 21st - 23rd December so make sure you note the date in your diary or come and join us in the Facebook Group - IHSW on Facebook. If you don't do Facebook then you can check in here. Welcome to the November Gifted Gorgeousness link-up. The link-up date will continue to be the 15th and I will keep the link-up open until the end of each month so you have plenty of time if you are late posting. 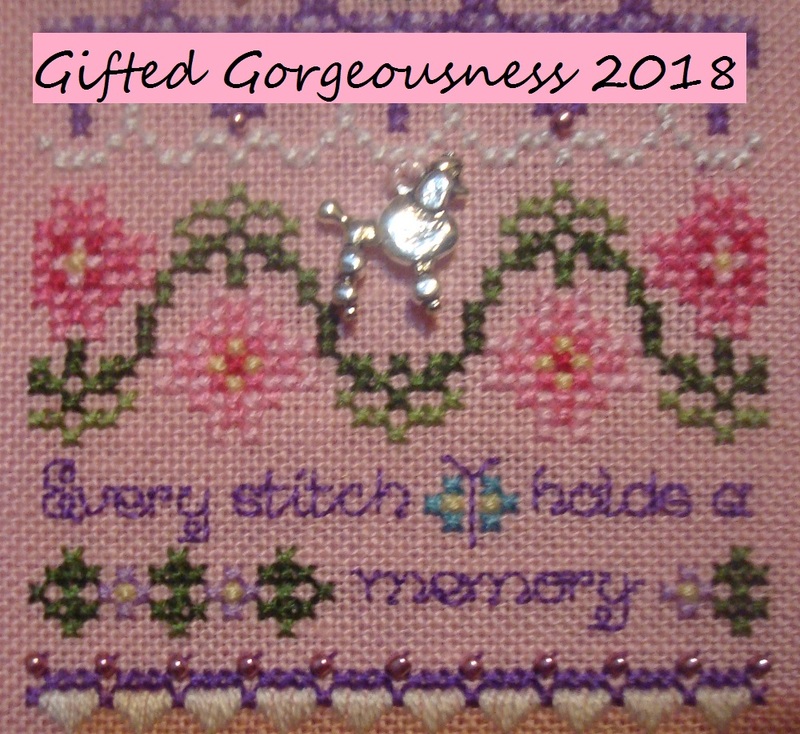 In the past month I have stitched quite a few gifted pieces and got three finishes too! Now it is your turn to show us your Gifted Gorgeousness for the month. Please use your name or your blog name in the field and NOT the words "November Update" so I can easily see who has linked up this month. And link to the actual post, not just your blog. It is easier if you copy and paste the link, rather than typing freehand. Just Nan brought out the Haunted Autumn Mouse in a House in 2017 and I just had to have one. These kits are very limited edition and once they are gone, they are gone. Once Dark October was over I decided to make this my first Focus for a Finish piece and stitched on it every day. 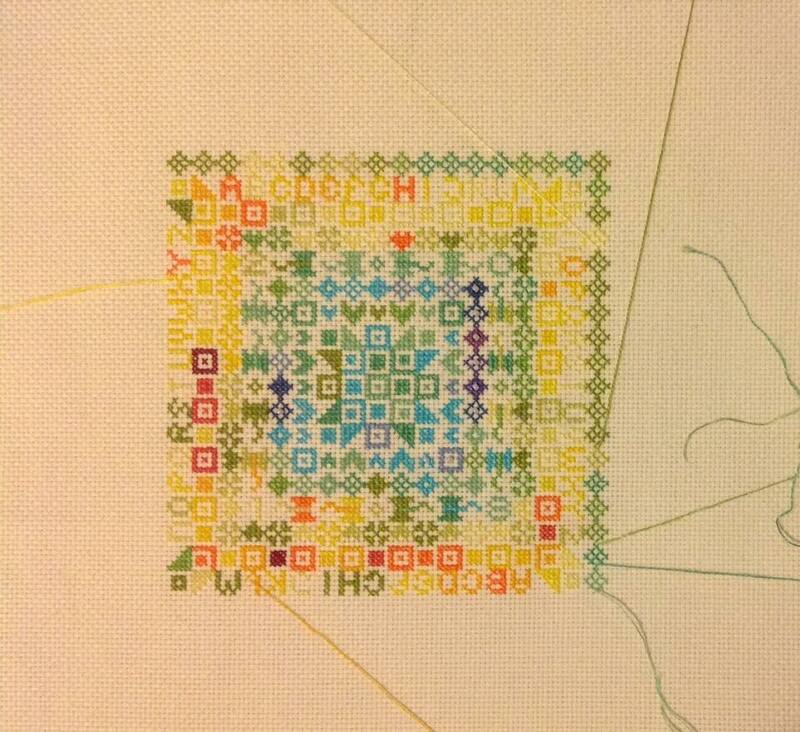 I finished the stitching on 10th November and spent the 11th and 12th fully finishing it. First I used iron-on interfacing on the backs of all the house pieces and then sewed the two floor pieces together with a card square inbetween to give them stiffness. After that I cut out and sewed triangles of felt to the back of each of the walls. The ribbon was sandwiched between and sewed in at the top. When you untie the ribbons, the walls flatten and you can see the little mousie in the housie! I made a little video film of the whole thing just to show you how it all works, and how tiny the mouse is! Unfortunately it was too long to upload so we had to break it into two pieces. The first video shows the house and the second shows the mouse ending with it balanced on my finger so you can see the scale.